Chamomile is a daisy-like plant, well-known for its calming effect, but for many reasons, it is a “must-have” plant of granny’s choice. It is also used as a remedy for numerous medical conditions, but foremost as a relaxation tool, which is why chamomile tea is my first thought at the mention of chamomile. However, other than this, it is widely used in cosmetics for treating acne, but also for lightening hair. Two most common varieties of Chamomile are German (wild) and Roman (garden) chamomile, German being the most commonly used in Croatia, primarily because it is very mild and has no harmful effects. They are strong aromatic plants and can grow up to 30 cm. Leaves are divided into thread-like segments and have white flowers 2.5 cm long. Native to many European countries, this plant grows everywhere – in fields, on slopes, meadows. It is most often used to treat digestion problems such as cramps or bloating. Its anti-inflammatory properties make chamomile effective in treating skin inflammation and tear duct. It can also be offered to children in case of stomach pain and cramps. Chamomile baths can be very relaxing, so if you want to restore your inner peace or just clam down after a hard day or a period, treat yourself with a luxurious chamomile bath. Chamomile will also do wonders for your face. 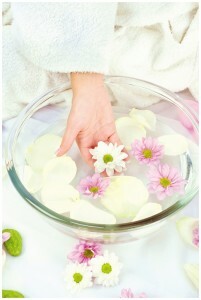 Once a week prepare a chamomile bath and soak your face in it. Soon you’ll notice how your skin becomes fresher and more vibrant. Blondes can use this plant to nourish their hair and enhance their hair color. Squeeze the lemon and then strain it through the gauze (fine cloth) to remove any pulp. Put the lemon juice into a pump bottle. Then prepare stronger chamomile tea. Mix the tea with the squeezed lemon juice in 1:1 ratio, stir carefully and close the bottle. Apply this mixture evenly over your head. For the best results expose your hair to the sun – as long as possible. A few hours later, rinse and normally wash your hair or use the chamomile tea you’ve previously prepared instead. Of course, this method will not work equally well with everyone, natural blondes can expect better results. Take a one-liter bottle and fill it with chamomile flowers and olive oil. Leave it to sit for two weeks and then strain into anther glass bottle and store in a dark place. Chamomile oil is great for treating joint problems. Apart from that, it can be used to treat skin conditions like allergies or other irritations. Chamomile is not called the queen of herbs for no reason. Use its tremendous properties to relieve problems in a natural way.